Founded in the year 2008, we are engaged in manufacturing and supplying a comprehensive array of Air Pollution Control Equipment. Our range of products includes Industrial Blowers, PP Scrubber Units, Laboratory Fume Hoods, Chemical Storage Tank in PP/FRP, PP Settling Tanks and P. V. C. Lining on Tanks. These products are manufactured using supreme quality raw material, which is procured from the reliable vendors of the industry. Based on advanced technology, our equipment are designed in accordance with international quality standards. Our products are popular for their features like durability, corrosion resistance and low maintenance. 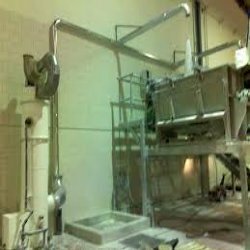 In addition, we also offer Fabrication Services that are appreciated for their accurate results and cost-effectiveness. Our services include Fabrication and Erection of Heavy Pipe Work, Gems & Jewellery Works (Refinery Works) and Chattka Unit Setup. We are empowered by a team of skilled and competent professionals, which is the biggest asset of our organization. These employees work in close coordination with each other to offer the best products and services to our clients within the committed time frame. Moreover, they welcome the suggestions of the clients about offering more advanced and better products to them. It is because of their sincerity and dedication efforts that we have been able to garner a wide clientele across the domestic market.